Brantford – Wilfrid Laurier University’s Brantford campus will host a public talk Feb. 9 with Canadian author Eden Robinson, as she launches her latest novel, Son of a Trickster (Knopf Canada). 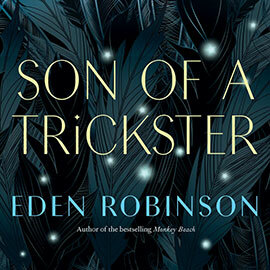 Son of a Trickster is Robinson’s first sustained work of fiction in almost a decade. Her first book, Traplines (1995), is an award-winning collection of four dark and gritty short stories that was met with critical and commercial success in Canada, America and the United Kingdom. She followed up with two subsequent novels, Monkey Beach (2000) and Bloodsports (2006). In 2011, she published a series of lectures titled, The Sasquatch at Home: Traditional Protocols & Modern Storytelling. Robinson has won numerous awards for her writing, including the Ethel Wilson Fiction Prize in 2001 for Monkey Beach, and the Writers’ Trust Engle/Findlay Award in 2016 for her body of work. She has been a writer-in-residence at the Whitehorse Public Library, and works with the Writers in Electronic Residence program, which links schools across the country with professional writers. Robinson will be the final speaker in Laurier’s Canadian Women Writer’s Speaker Series. The series, which was piloted this academic year, is designed to provide Laurier’s Brantford community with an opportunity to interact with internationally recognized Canadian women writers. In the winter term, visiting writers included Laurier alumni Kathleen Martin, and Winnipeg writer and festival organizer Charlene Diehl. Eden Robinson’s talk will take place in Odeon Building 110, on Laurier’s Brantford campus, from 4:00-5:30 PM. The event is free and open to the public.